Courtesy rendering City’s application for a grant excludes the pocket park (lower left) that was part of the original plan. GRAND RAPIDS â They’re not sure how the city will raise the necessary local matching funds, but city commissioners today applied for a $300,000 state grant to build a new park in the south end of the Heritage Hill neighborhood. 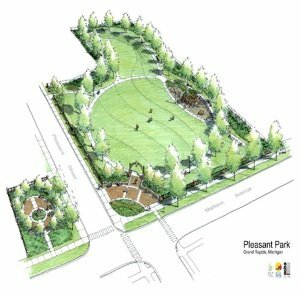 “Pleasant Park” would replace a 2.3-acre parking lot at the corner of Pleasant Street and Madison Avenue SE. The parking lot was used by the state’s Department of Human Services until it moved last year. Although the application to the state’s Natural Resources Trust Fund says the city will use $130,000 in federal Community Development Block Grants as part of its local share, city commissioners said they are confident they can find the money elsewhere. First Ward Commissioner David Shaffer said he wasn’t so sure. He cast the sole vote against the application, saying he did not want to commit federal program dollars to the project. Building the park would cost $730,780, city Parks and Recreation Director Jay Steffen estimated. That’s below his original estimate after they eliminated a pocket park for a vacant lot at the northeast corner of Madison Avenue and Pleasant Street. Two weeks earlier, residents of Heritage Hill crowded a public hearing in favor of the park. Mayor George Heartwell said he was confident the city could find private sources for the local matching funds and leave the federal funds alone. “We simply have to certify that those funds are available,” Heartwell said. If the city cannot raise the matching funds and is unwilling to use the federal funds, it could return the grant, he said. “I’m confident we can raise the entire amount and that the state will work with us,” Steffen said. He urged commissioners not to downsize their plans for the park in order to reduce the local match. Third Ward Commissioner James White said the city was taking on an “appropriate risk” in the grant application. “I think it’s an important opportunity and we should move forward,” he said.